- prolonged use of NSAIDs. I was found to be iron deficient (the first two factors are applicable in my case) and my GP prescribed iron supplement tablets to boost my iron levels. However, these tablets caused more bad than good. And I am not talking about diarrhea or black poo! I had side-effects ranging from nausea and stomach pain to light headedness whenever I took these tablets. Since I could not take them everyday without experiencing side-effects, I reduced the intake. But the problem persisted. I then stopped taking the tablets and made a lot of changes to my diet; trying to incorporate as many iron-rich vegetarian foods as I could - dark-green leafy vegetables, brown rice instead of the regular white rice, pulses and all kinds of beans. But I still had the issue of feeling lethargic and tired always. My chronic auto-immune condition is partly to blame for it, while iron deficiency is another cause. A while back I came to know about Spatone, a naturally occurring iron-rich mineral water, which the makers claim is gentle on the stomach and easily assimilated. I had a chat with one of the lovely ladies from the Spatone team and I was sent some samples of Spatone Apple to try. Spatone Apple is an apple flavoured version of Spatone's original formualtion with added vitamin C. It comes in convenient, one-a-day sachets, with each sachet providing you with your recommended daily amount of iron. The presence of Vitamin C increases the absorption of iron. Taste wise, the apple version tastes mildly like apple juice though I could taste the presence of iron as well (slightly metallic taste). I mix it with a glass of plain water and drink. I did not experience any stomach pain or nausea or dizziness when I was on Spatone. I took Spatone for a week without any noticeable side effects as it usually happens with iron tablets. I do not know if Spatone has made any difference to my Hb levels but I did feel a little less exhausted than I normally do. Spatone is expensive. 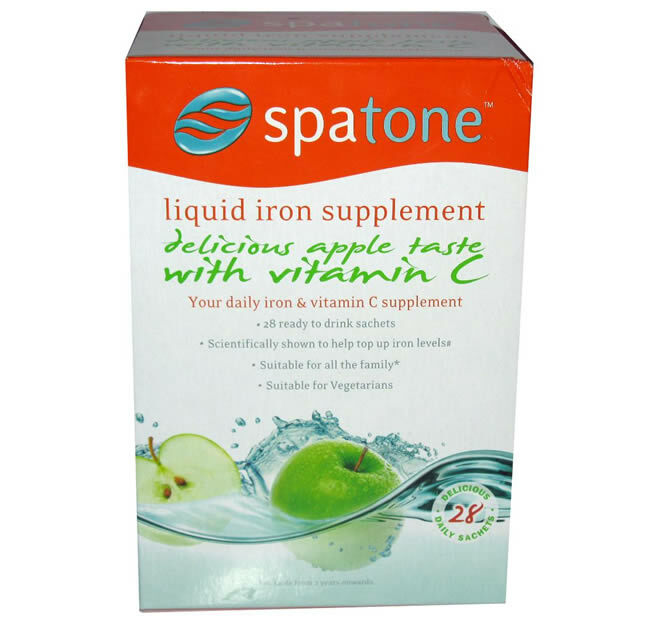 But if you have iron deficiency and iron supplement tablets are not working for you, it is worth giving Spatone a try. You will find it on offer on Boots, Tesco or Amazon. But as with any supplements, please consult your GP before you start taking them. Have any of you tried Spatone for longer durations? Did it work for you? Please let me know in the comments section below.